I am now the proud owner of a Quantum 5 Qt. 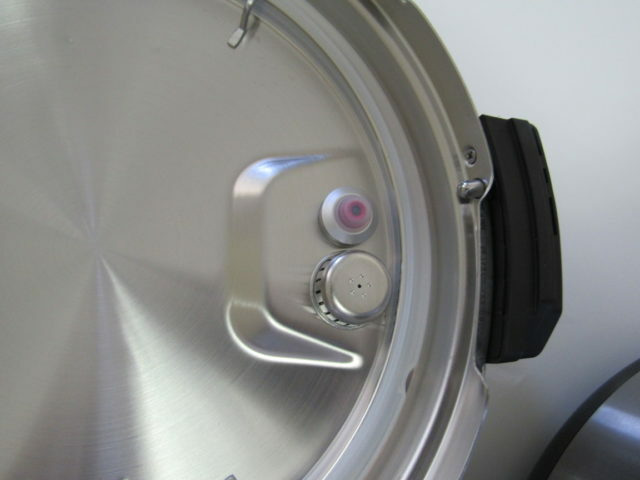 Stainless Steel Pressure Cooker. Everyone I know uses a pressure cooker but I’ve never used one before. I think the biggest reason is because I was a little frightened off by the thought of these powerful cookers. 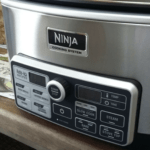 It wasn’t until I learned about the electric pressure cooker now sitting in my kitchen, that I decided it was time to get over that fear and it’s been the best decision I could have ever made. When I think back to all of the meals I could have cut the cooking time in half on, I just SMH. I could have used those hours to do something else, like read a good book or I could of even taken a yoga class. I’m not sure why an electric pressure cooker doesn’t frighten me in the same way as a conventional (stove top) pressure cooker because they’re all safe to use if used properly (however, I’m more comfortable in knowing that I don’t have to fiddle with heat settings with my electric pressure cooker). 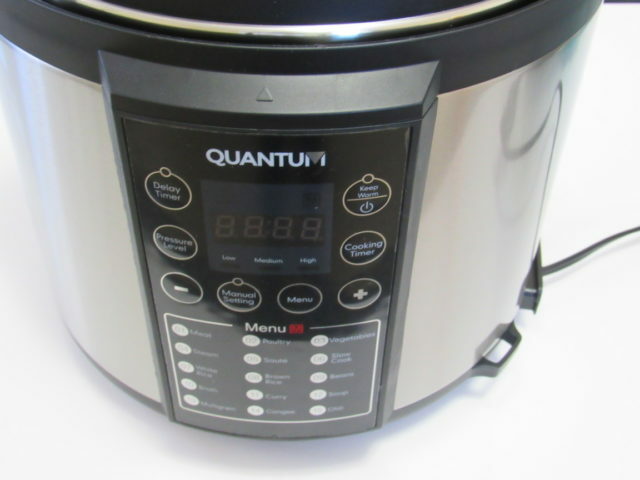 I love that I can get rid of some of my electronic appliances because the Quantum Stainless Steel Pressure Cooker does so much more than I realized it could. 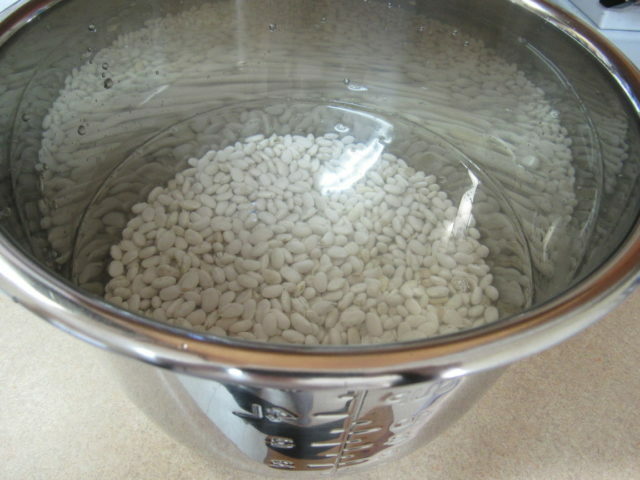 Today, I used the slow cooker setting to make some Northern Beans with a ham bone I froze. It’s larger than my slow cooker so I can make a family sized meal in it where as my slow cooker only makes approximately 2 servings of whatever I make in it. 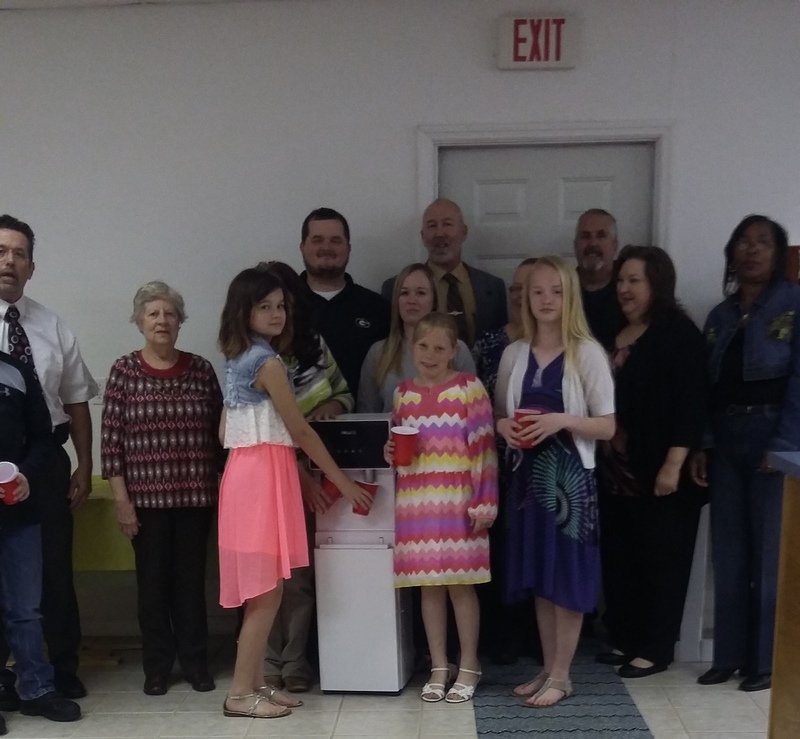 It has a 6-liter capacity so it can make enough for any family even large families. I’ve already thrown out my rice cooker (because it was so hard to clean) and this cooker is going to replace it as well. Yes, you read that right, my new electric pressure cooker is now my rice cooker too. 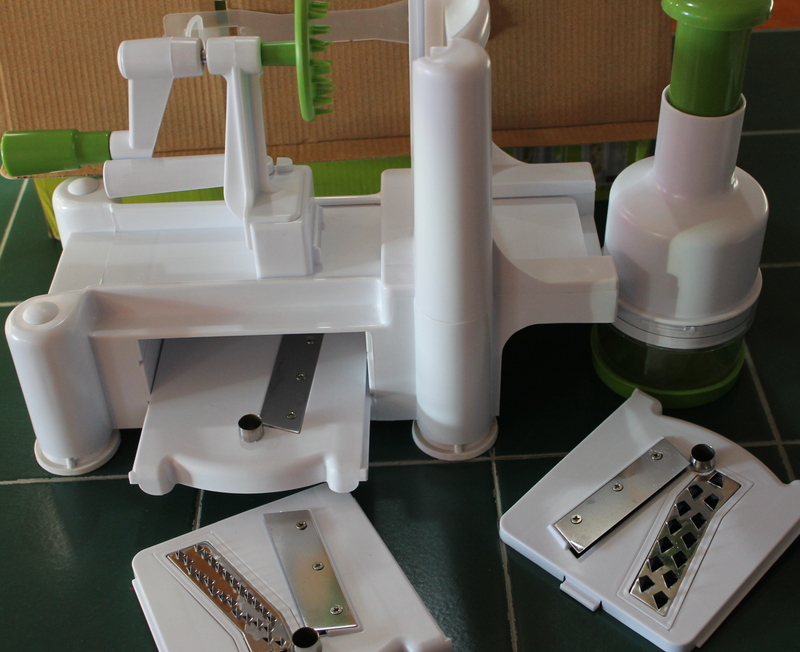 I can make anything in it from meats and vegetables to rice, chili, beans, soup and so much more. I also like that I don’t have to tie up any of my stove top burners to use it. In fact, I don’t even have to be home to use it. I can set it to cook when I’m not home so when I get home, I’ve got a meal prepared, hot and ready to serve. You can’t do that with stove-top pressure cookers. As soon as my pressure cooker arrived, I cleaned the inner stainless steel pot and accessories (measuring cup, spatula, and spoon) and read the manual which was included. Knowledge is power. When I know what I’m doing, I feel safer doing it. 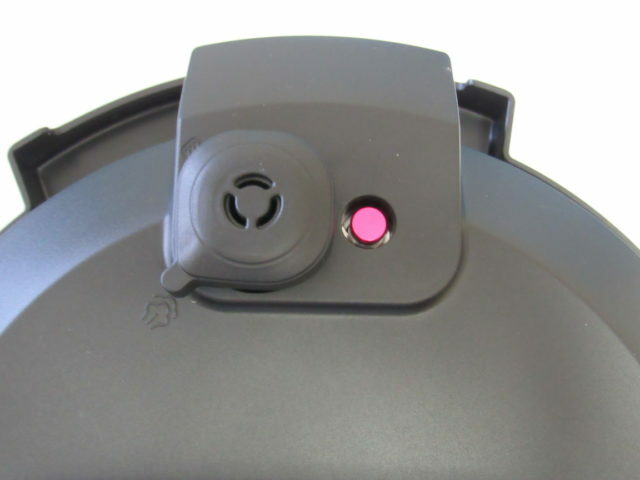 I took a lot of photos of the pressure cooker so you can see everything there is to see of it. It’s not in the least bit scary. It’s on the heavy side but that’s okay, I can tell it’s made well and that’s what I wanted. The warming feature will come in handy. Following the directions on how to select slow cook for my heat settings, I set it and forgot it until it was ready to serve. Well, not exactly, I could smell the dish while it was cooking and it was making me hungry. 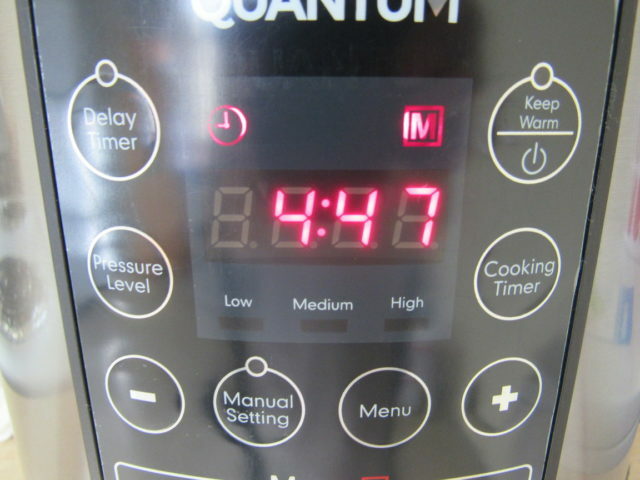 To set the cooker on slow cook, select Menu, use the + until you reach P06 for slow cook (5 times as it starts with P01). Once it realizes you’re through (a few seconds or more) it will show the time it will take and start cooking. For the slow cook method I used for my beans and ham it cooked for 8 hours. This is going to be my favorite setting when I’m going to be away during the day. The one thing I’m still a little confused about is the valve. 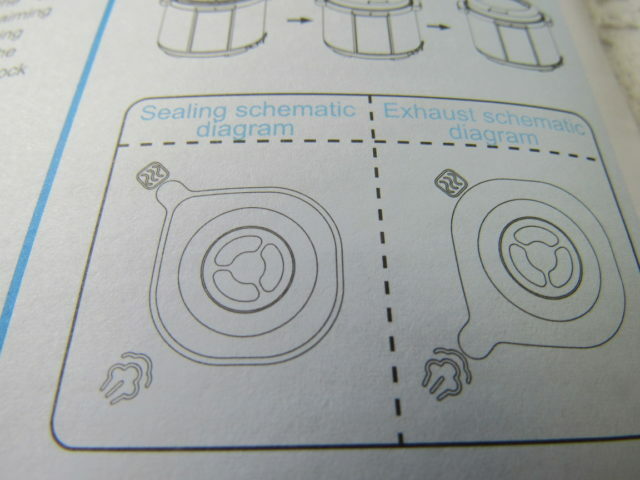 You have two settings, sealing schematic or exhaust schematic. I’m baffled by the difference in these. Sometimes I can be a little slow daft about stuff so it’s going to take a light bulb moment for me to let it sink in. I’ll update when I find more information to add. I kept it on Exhaust for my Northern beans recipe. 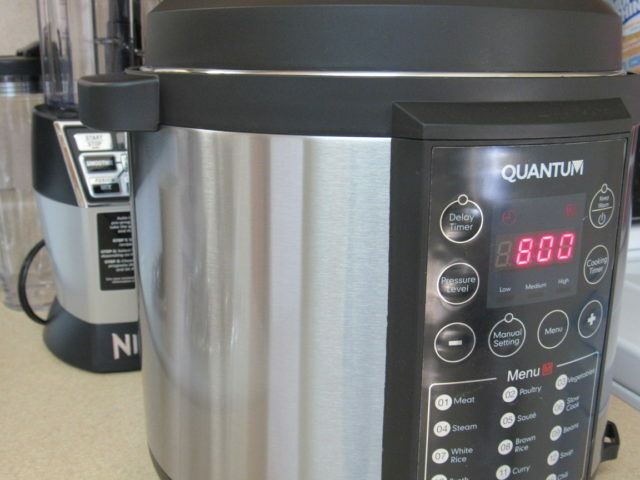 If you want to learn more about this pressure cooker, head on over to FortheChef for information and to make a purchase. 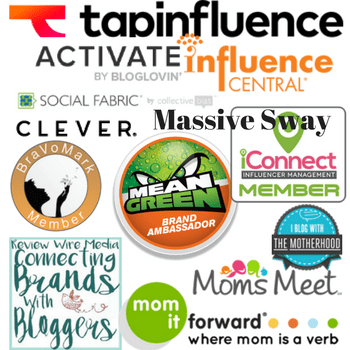 Follow socially to stay up to date on products, news and promotions: Facebook, Twitter, Instagram, YouTube. I have been terrified of them, but now with the new ones…I need one. I told my family I want one. I don’t care what event they decide to give it to me for, I just better get one. 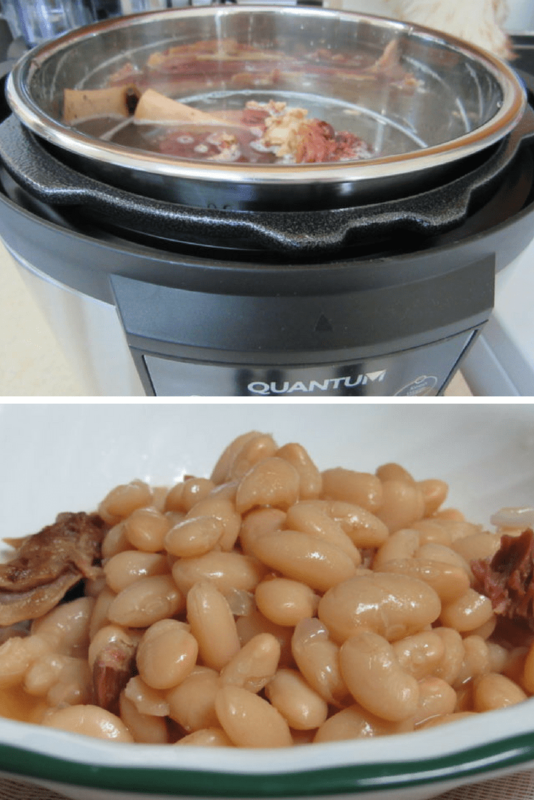 My mom has always used a pressure cooker and she cooks her beans this way too, with ham bone. It seems like I need this pressure cooker. 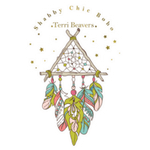 Loved your post, thanks for sharing! I don’t have a pressure cooker but having hearing about how easy and quick it is to prepare meals on them. This one looks awesome and this recipe looks delicious. 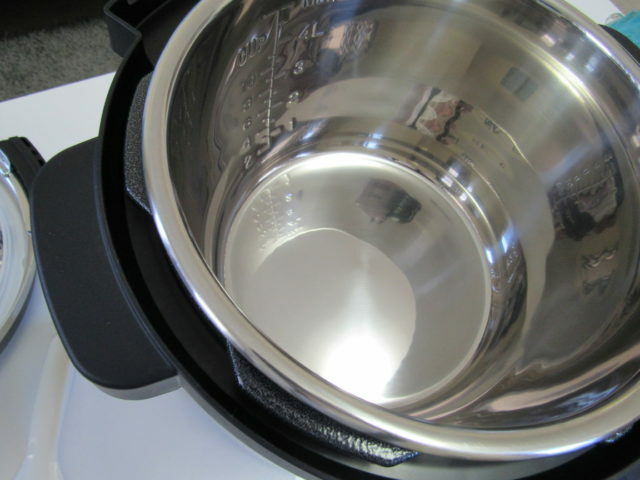 I have heard so many great things about electric pressure cookers but haven’t used one yet. I know my mother-in-law has one and she really loves it. 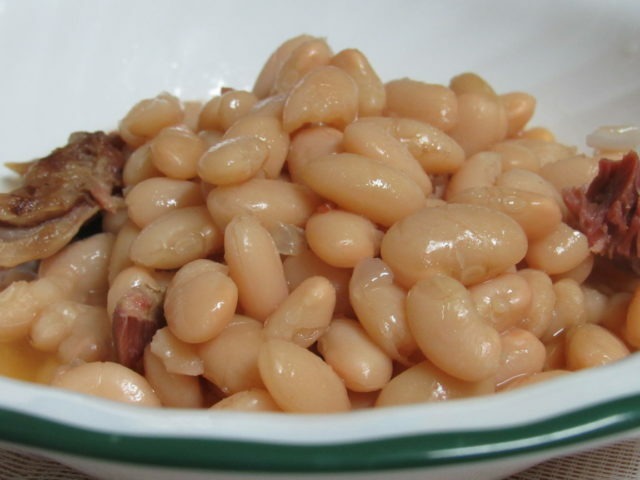 Those Northern Beans with a ham bone look like a perfect dish for those cold winter days. I don’t spend a lot of time in the kitchen so I wonder, what’s the difference between a pressure cooker and a slow cooker? I do not own a pressure cooker. I admit I want one but haven’t because I have a slow cooker. I have been always scared of pressure cookers because of all the news of them exploding or something. Well, that was ages ago and I guess the ones you can get now are safe to use. The one you have looks so hi-tech! I would want to have one too. I don’t have a pressure cooker, but have been contemplating getting one. It would be great to have a dinner that tastes like it took all day, only take minutes. I love a good pressure cooker like this that can do so many things. We recently got one and I freaking love it. I would cook everyday if I could use it all the time. I just inherited my grandma’s stovetop pressure cooker. I could see how an electric one might work better for me. Thanks for the recipe to test out in my pressure cooker. My husband has been talking about getting a pressure cooker for quite some time. I’ll have to look into this model. Thanks for sharing! Anything that makes cooking more efficient sounds good to me. I would love to try a pressure cooker, especially on nights were I forgot to defrost food or pre-cook something. Northern beans are my favorite beans! I have been on the fence about getting an electric pressure cooker, but every recipe I see makes me want one more. I do to own a pressure cooker and do not even know how to use one. I’m super curious though and wonder if I could use one of these. Are they better than a slow cooker? I work long days out of the home and wonder if I could leave this unattended. I love using my pressure cooker, it’s such a blessing to have one especially if you’re a little too busy to cook. This one sounds like it’s very easy to use! We have a similar appliance! I would love to try this recipe in it! It looks SO good, filling and tasty! I love also how easy it is! I love beans and ham, but my kids don’t like them! It’s great how quickly you can cook them in a pressure cooker. 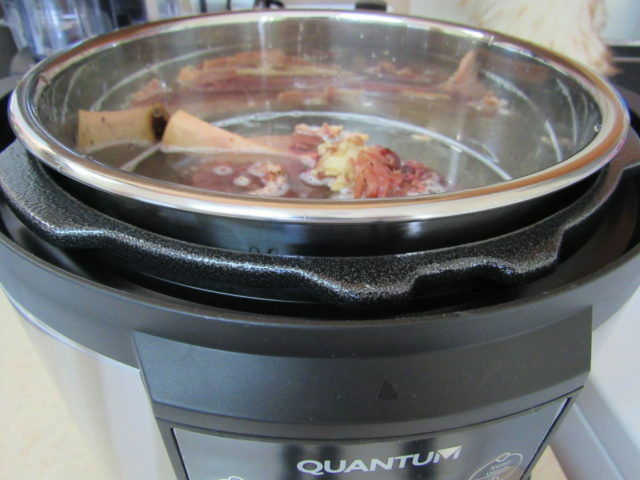 I have never used a pressure cooker to cook my beans and Ham bone, but I may have to give it at try. I always use my crock pot to cook beans and ham, so I am going to have to give this a try. I really have been looking into getting a pressure cooker. It is such a fast an good way to cook! 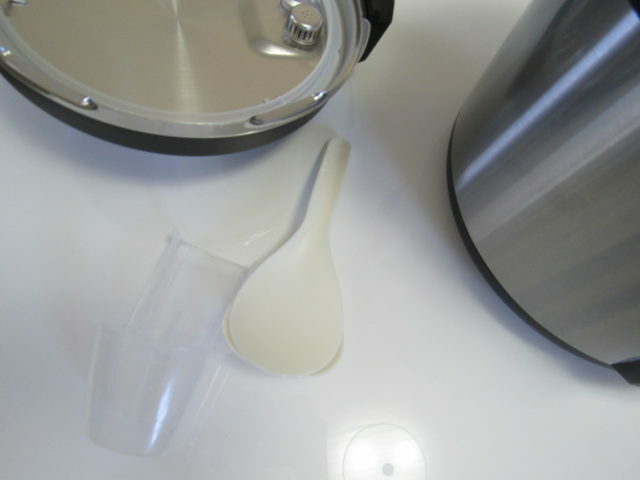 I want to make bone broth in one! This looks like a good one! 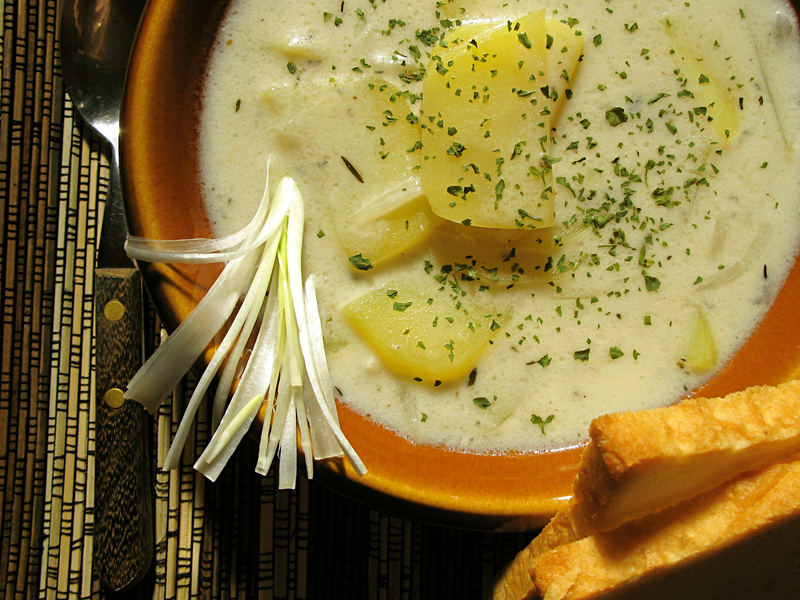 The pressure cooker is really useful in the kitchen, but must be really careful when using it. Your recipe looks delicious! I always find recipes online that require a pressure cooker, but, for the life of me, I’ve never really thought I needed one. For me, its just one more item that I have to find storage for, but I do end up missing out on good recipes! This sounds awesome! I have to admit that I am always a little intimidated by kitchen appliances because I am such a terrible cook, but this might be one that I can master! We cook a lot of rice so this would be great for our house. I can’t wait to give this recipe a try. I recently started using a pressure cooker, and I’ve been looking for some new recipes. Thanks! 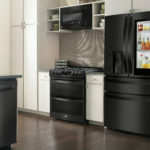 Actually, it can replace several appliances you already have so you’d only have 1 gadget to store :). 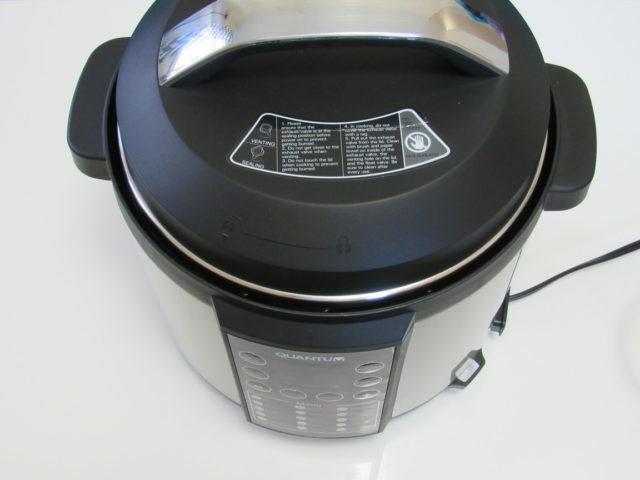 So easy to cook a meal in this Pressure cooker. I am sure this saves alot of time than the other stove top pressure cookers. I like that it has a totally new look with timer and all other stuff. Set the timer and forget it 🙂 I Will check it out. I haven’t jumped on board yet with purchasing an electric pressure cooker. I know they save time cooking. Not sure how much I would use it and just one more gadget to store. Pressure Cookers sure have come a long way! I remember being terrified when my mom was using her pressure cooker back in the day. Your beans look so good. Wish I had a big bowl of them. Now I want a pressure cooker like yours. That is so amazing! 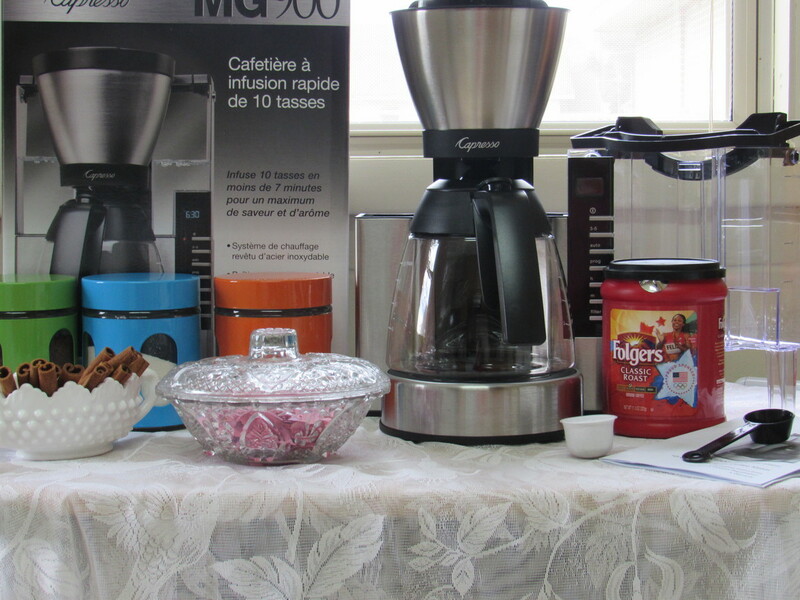 I am addicted to appliances. I hadn’t seen the Electric Pressure Cooker. Thank you for the pictures, they were very helpful.